Almost everyone knows how common it is to see new Zelda games include elements that have become staples of the series. Is there a Zelda fan that sees an arachnid or insect boss with a single eye and doesn’t yell “Gohma!”, or someone who doesn’t recognize the labyrinth of identical forks that was first established with the Lost Woods? For some Zelda fans it seems like it’s seeing these throwbacks to earlier games that define Zelda for them. To a greater or lesser degree, it’s these familiarities — or the reappearance of other familiar elements I have not stated; I’m not trying to be comprehensive here! — that they wait and look for in each new Zelda game. But can you really say that’s what makes a Zelda game great? A Link to the Past is one of the more beloved titles of the series among many of the classic fans — though less so than Ocarina of Time — and it didn’t borrow much from the original Legend of Zelda. Even many of the now-common sights we see in Zelda that can be dated back to the first game were skipped over in A Link to the Past: The often-recurring boss Gohma doesn’t make any appearance, and while the Lost Woods is still mazelike, the format of identical pathways is missing. Skyward Sword changed how combat controls were done, and ditched the name Gohma even though it had a one-eyed (or is that three-eyed?) arachnid in Moldarach (yes, scorpions are arachnids). The DS titles receive a lot of criticism from many fans, but the fact is they weren’t bad just because they attempted a new control scheme or had a central dungeon concept. None of these were bad games because they didn’t include familiar elements or because they deviated and made changes, and neither was the famous Ocarina of Time for shaking up the gameplay formula. Targeting enemies and characters, and auto-jumping upon reaching a ledge, were not in the series prior to its debut on the Nintendo 64. 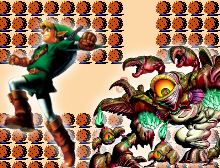 While these innovations were adopted by numerous — but not all — of the later Zelda games, they were completely new at the time and were major changes to the gameplay of games like A Link to the Past and Link’s Awakening. These familiarities in the game’s areas, characters and challenges, and also in how the gameplay is approached, do not define Zelda nor make it good, and Ocarina of Time itself, the most beloved game of the series, is one of the greatest testaments to that. They don’t make it bad either. Again Ocarina of Time is the perfect example, since it judiciously reused some elements as well, such as Gohma, Dodongo, and the Lost Woods. Or how every 3D console Zelda game has borrowed its gameplay since and for good reason. Don’t get my sentiment wrong here: I’m not saying that Zelda should stop using these familiar aspects. Quite to the contrary, I’m saying they don’t matter one bit one way or the other when looked at broadly. They generate nostalgia, and nostalgia is fun. Sometimes, particularly with gameplay mechanics, they’re just downright good ideas that shouldn’t be changed. Staples shouldn’t be relied on if a more-fulfilling gameplay experience can be found by deviating from familiarity, but at the same time, saying familiar elements need to be ditched in a constant search for the new is a bad mentality to have, too. Nostalgia is powerful, and even if you’re not nostalgic about a familiar element… well, then it’s just new and fresh for you, isn’t it? And sometimes recurrences become the norm because they’re good things to reuse. Other times something is old, its fun has been exhausted, and something new needs to be done. We need to be open to both situations. Sometimes a game is familiar and crafted out of elements we’ve seen before. And sometimes it’s totally new and breaks the mold. Both are fine. Neither is a superior way to create any game, let alone a Zelda game, and it’s all about how you design the game. If it’s well-made it can make either the new or the familiar work. Zelda fans shouldn’t hate on games that break the frankly often arbitrary traditions of the series in favor of treading new ground, nor should they get disillusioned with the series for reusing fun elements that people enjoy. The Zelda series has many games, some very similar to each other, and some very different. But what it’s always been is relatively open: Many different styles and worlds have been explored in the series, and the worst thing that could happen to it is to restrict it to being all-new or all-familiar. Each Zelda game just needs to do its thing. Zelda’s always blended the old and the new in varying proportion from game to game, and that’s what makes the series great.